Find out what makes the architecture of the first free library in the United States stand out. 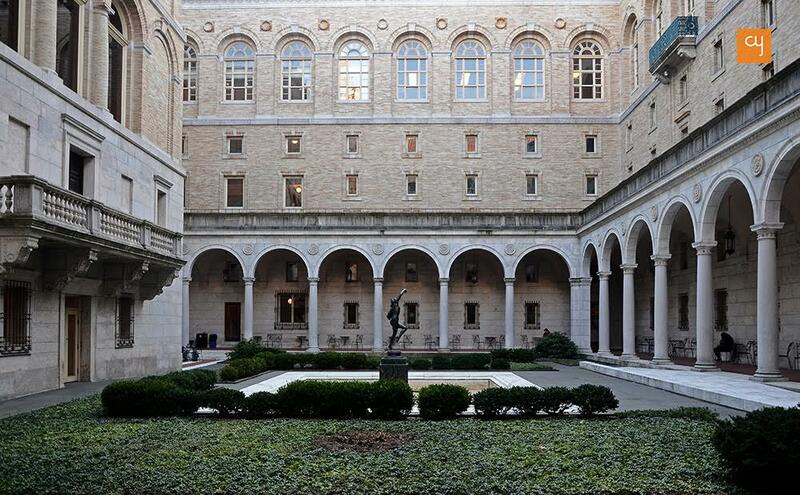 Take a visual tour of this eclectic collage of art, architecture, religion and literature at the Boston Public Library. As you step into Copley Square in Boston, you might be surprised to see a massive monolithic block of granite before you. Only the carvings on its surface lend it the semblance of a habitable block. Standing opposite the colourful Trinity Church, its austerely monochrome presence seems almost foreboding at first. Though Boston is full of historic buildings, there’s something about this one that gives you a sense of seriousness and significance like no other building in the city. 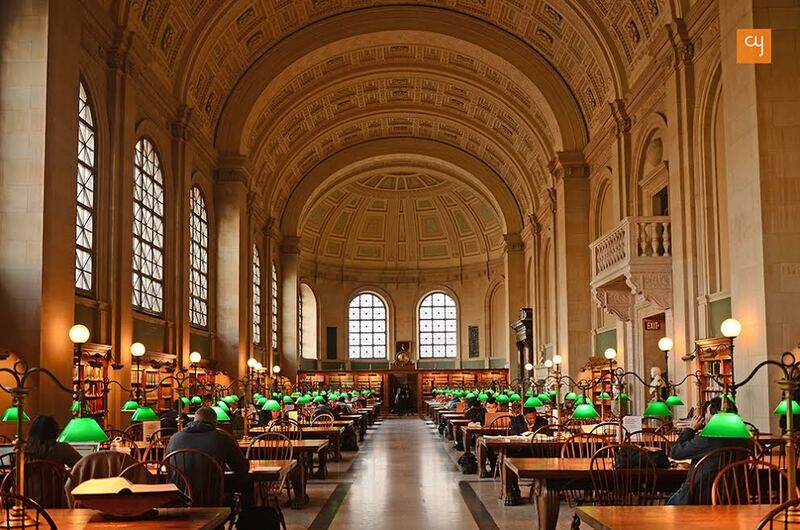 Fittingly enough, it is the Boston Public Library. Carved above the entrance gates are the words ‘Free-To-All’ as wrought iron lamps extend like antlers to greet you into what was the first-ever free library to have opened in the USA in 1895. The concept of having library facilities be free for all is a commonly accepted one in the USA today, but back in the 1800s, this was a novel concept and one that its architect Charles McKim took very seriously as he rendered the building in dramatic Beaux-Arts style. The names of 540 authors, philosophers and people of reckoning are carved along the length of the building’s facade (according to the guide, only 11 women made it to the list). When I arrived here for one of the library’s free daily Art & Architecture Tours, I didn’t expect much, going by the austere appearance of the building. But once inside, my imaginal mind was tickled by all the metaphors and symbols at work in the building. The library is a symbologist’s dream come true. You enter the building with all the fanfare of entering a church. 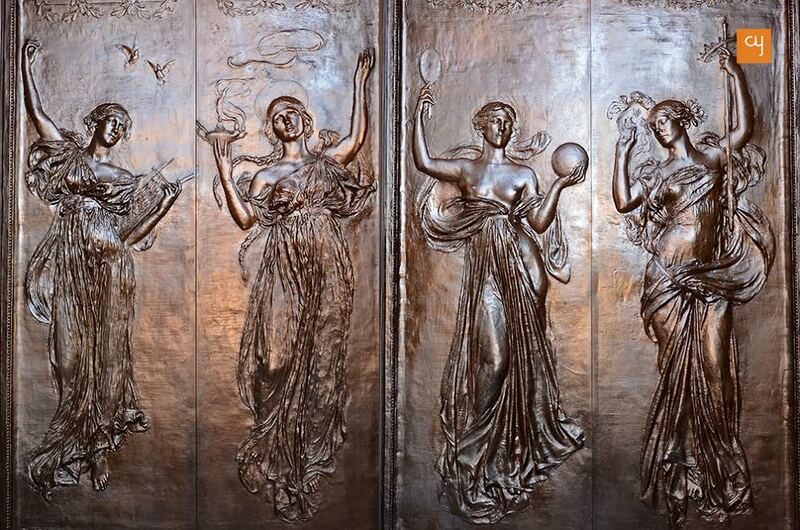 Bronze doorways sculpted with the delicate muses of poetry, music, wisdom, knowledge, truth and fiction, herald you in. The muses are all carved by Daniel Chester French, the same man who gave Washington DC its mammoth statue of Lincoln. That the same hands could carve such a colossal sculpture as well as such delicate embossing, seems wondrous. 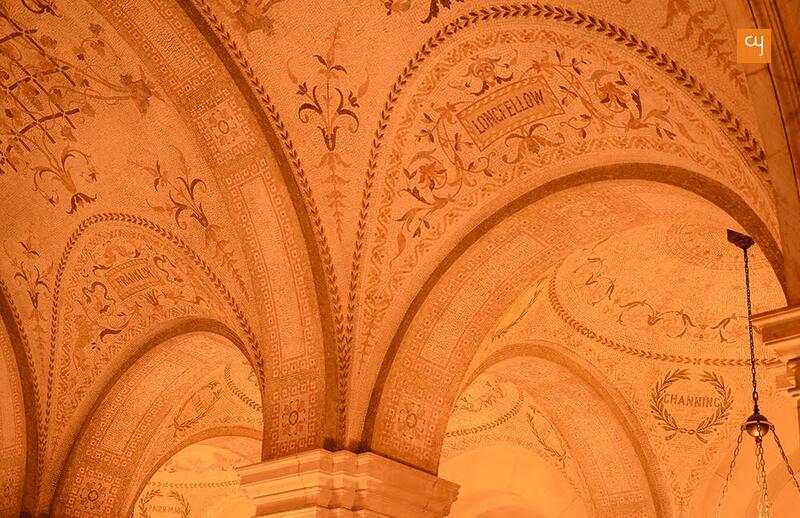 As if this weren’t enough, you then enter a vaulted vestibule covered with mosaic-work that pays ode to the most famous men of Massachusetts – Franklin, Hawthorne, Longfellow. What’s delightful is the softening that begins to happen now, once you’ve passed through that fortress-like facade. It’s a delicate world in here, full of the kind of beauty and poetry that fits a program like a library more, at least in my mind. But you’re in for a further surprise, one that you wouldn’t expect at all. Because beyond the vestibule is a courtyard that will transport you back to an arcaded cloister in Rome, with its lush green oasis. Here stands a copy of the controversial statue Bacchante and Infant Faun, which has made its way back again after 19th century Boston refused to let the “drunken indecency” of a naked damsel find its spot in a place as pure as a library. Bacchante now prances joyously at the heart of this beautiful court. And indeed, one might argue, why can’t books be associated with pleasure? But this still isn’t the extent of surprise offered by the building. Inside, there are even more astonishments at bay. Almost like a church, the library is full of murals. 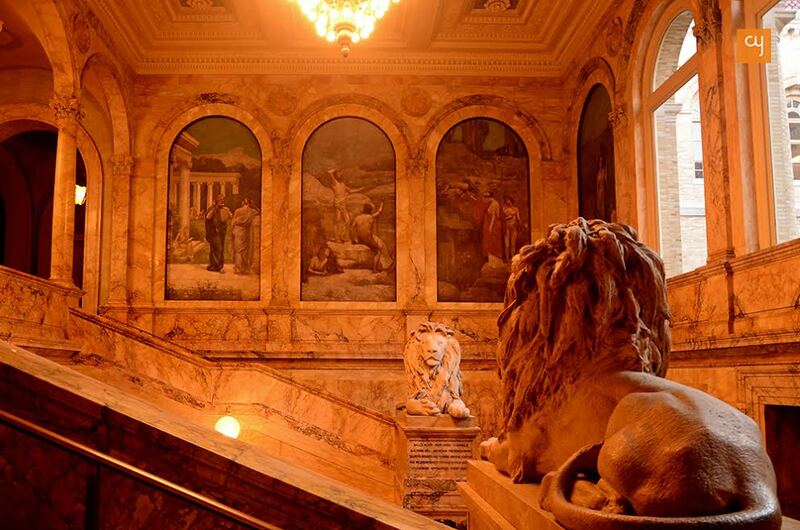 As you ascend a grand vestibule rendered in yellow marble from Sienna, you are greeted by two giant lions carved in stone and met by murals of fairies and stalwarts of the eight arts and sciences. Homer stands astride epic poetry, while a fairy produces the magic of chemistry. Plato preaches philosophy, while Virgil stands beside a stream of pastoral poetry. 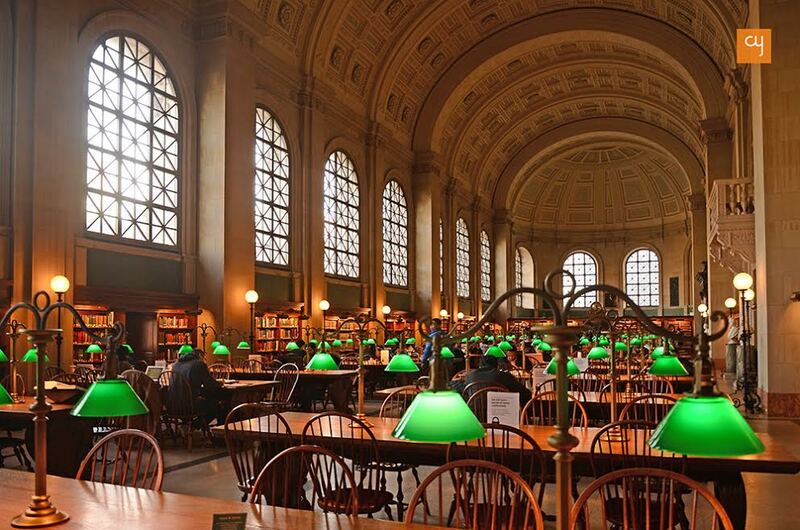 But all these still serve only as preambles to the highlight of the building – the reading room called Bates Hall. Greeting the doorway to the hall are the muses of inspiration that herald the angel of Enlightenment, who blesses two figurines that sit to read and contemplate. The artist of this mural, Pierre Puvis de Chavannes was the most notable muralist in France but story has it that he was 72 at the time of the commission and could not make it down here to paint the mural. 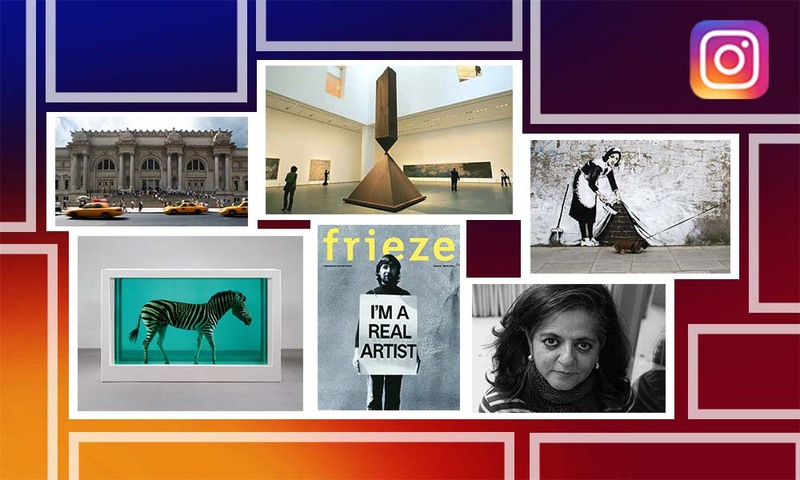 So he dispatched the artworks all the way from his studio in France. Such a lavish entry to the Bates Hall is only fitting, for once you enter its giant volume, you know that it’s not wrong to call it a kind of cathedral – indeed, it’s inspired by a Roman basilica. A massive vault lumbers across the length of the building as light filters in from high above onto gorgeous wooden desks bathed in the soft light of delicate green lampshades. I’m almost hesitant to sit here. Is this room really free and open to all? I almost feel I should be of nobility to sit and read a book here, to bathe in such volume and light. 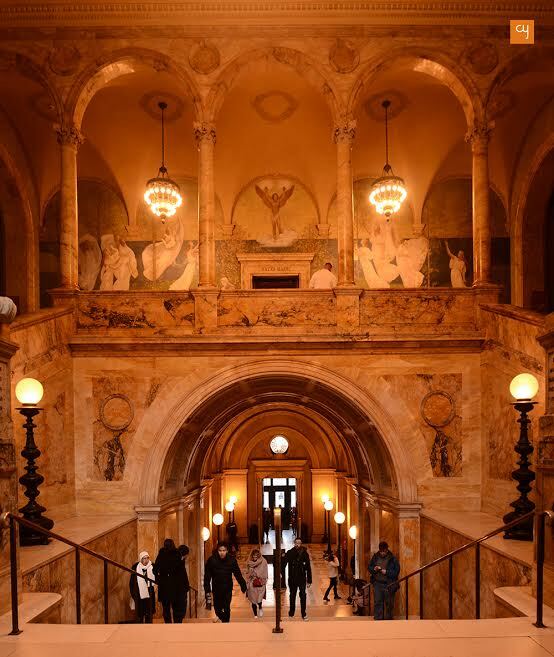 It might not be incorrect to call the McKim Building a curious marriage of art and architecture. For beside this austere Basilica space is the Abbey Room, a space that’s inspired by the Doge’s Palace of Venice, with a long panel telling the story of Sir Galahad’s quest for the holy grail – a fitting story perhaps for the metaphor of pursuing your true path. And that’s not all. The uppermost floor, besides housing a collection of rare books, is fully painted with murals depicting the journey of the many religions of the world towards a future where they can be stripped of all excess ritualism and dogma and returned to something purer – a state that we still await, and for which the artist John Singer Sargent has left a blank wall. Before this commission, Sargent was mostly known for his works of portraiture. So when he got a whiff of such a large project happening in Boston, he poured every effort into ensuring he was commissioned a mural so he could establish himself as a master. Once the project was in his hand, he took 30 years to finish it. While the topic of religion was a controversial one for a library, with several not being happy with the choice, the artists commissioned by Charles McKim were all given the creative freedom to paint whichever topic they wished to. Incidentally, this grand building was architect McKim’s very first institutional building. Although well-known in Boston at the time, he had only made residential projects before this work. And so he also poured every effort into ensuring that it live up to its status as the country’s very first free library. 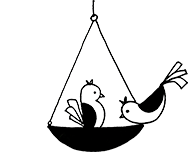 This is also the first time that a library deliberated on creating a section for children – a concept that’s considered something of a norm for all libraries today, but wasn’t back then. 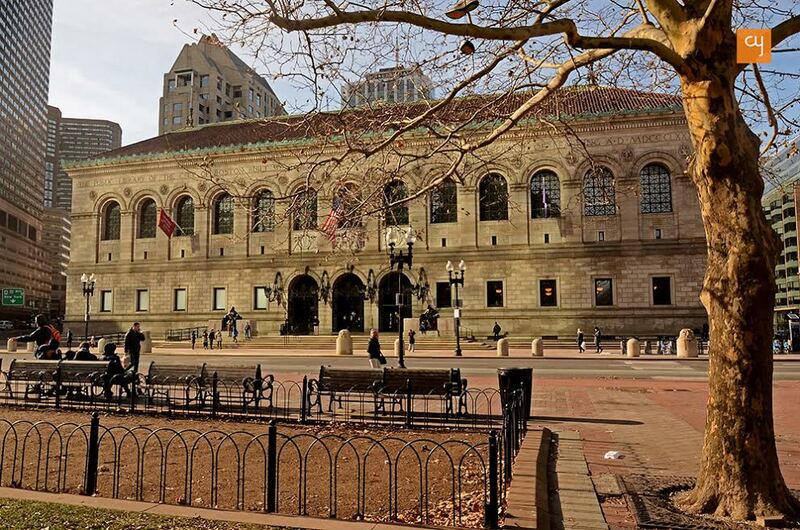 Today, the Boston Public Library has 24 branches across the city and serves as a venue for several public events like the Boston Book Festival. 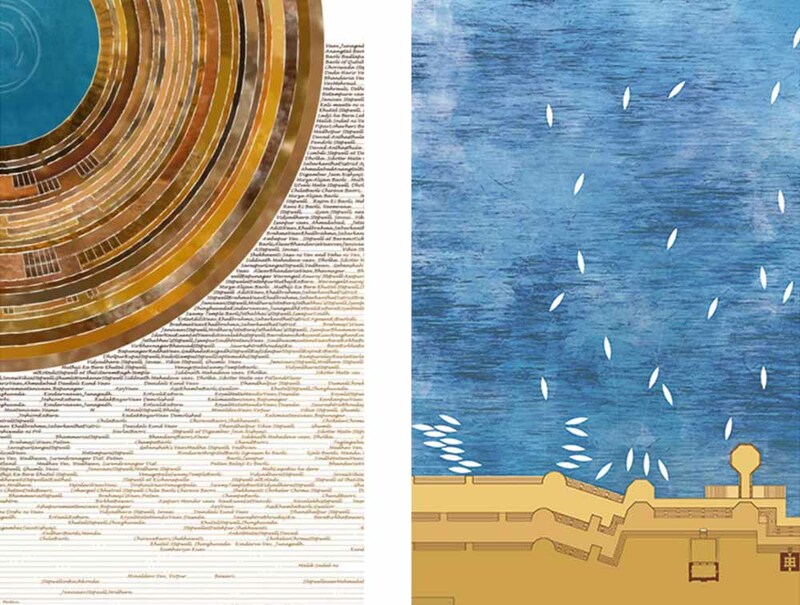 What has resulted from this collaboration of talent between artists and architect might be a collage of sorts, but a beautifully evokative one that makes the experience of reading in a library an almost sacred one. Although the extension designed by Philip Johnson in 1972 is surely lighter in its feeling, it can’t quite keep up with the richness of McKim’s work. Incidentally, both buildings are named after their architects. I’m reminded of the words carved underneath the muse of poetry on the bronze doors in the library’s entranceway – “True poetry is like the lodestone which both attracts the needle and supplies it with magnetic power.” The McKim building, like poetry, seems to succeed in both attracting the visitor and leaving him/her with renewed inspiration to learn.